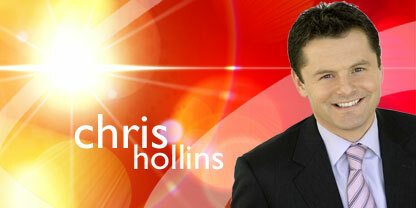 Chris Hollins to quit BBC Breakfast? What with GMTV’s presenting crisis over for now, it looks like the Beeb might have a few issues of their own to deal with. BBC Breakfast is moving from London to Manchester and it looks set to lose some staff if it does. Sports presenter and winner of last year’s Strictly Come Dancing, Chris Hollins, is reportedly so mad with the plans to move the show to Salford Quays, that he may do a Ben Shepherd, Andrew Castle and Penny Smith, and leave the show. Having recently bought a London pad he’s reportedly said, “No man in their right mind is going to buy a house 18 months before they are due to move to Manchester.” He is also thought to have issues with the guests on the show who he believes will not want to travel up north to appear on the show in a move that could come as early as 2012. Beeb bosses reckon the move will help to make the organisation less “London-centric” but with show anchor Bill Turnbull reportedly retiring before the move and co-host Sian Williams worrying about relocating with her four kids to Manchester, it’s proving to be every bit as difficult as the issues felt by ITV bosses with the GMTV revamp. Eamonn Holmes to present BBC Breakfast? Now that BBC Breakfast is moving away from London to a new home in Salford, there’s going to be big changes to the team as people will invariably not want to leave the nation’s capital. And so, who will front the new-look Breakfast? Rumour has it that it’ll be Eamonn Holmes. The show’s current presenters – Chris Hollins and Sian Williams – are apparently not best pleased about the move up North, with some staff adding that the move is “utter madness”. Boo hoo! Imagine that! A really well paid job making you up sticks! Anyway, what many don’t realise is that, by virtue of the fact they’ve got a really sought-after job, there’s a big ol’ queue of people willing to take it off their hands. The names already being put forward are This Morning hosts Holmes and wife Ruth Langsford. “Eamonn loves breakfast TV and the biggest show in town is BBC Breakfast,” an insider told The Sun. Fair play to him. If he’s willing to work/live outside of London, then let him have the job… although I’m pretty certain there’s a whole gaggle of people around the rest of the country who could be blooded and tried out. If the BBC wants to be more reflective of the country, then maybe they should inject some fresh blood on our screens? A decision has now been made to move BBC Breakfast to the BBC’s new production hub in Salford Quays, Greater Manchester. The move is part of the measures aimed at building a new relationship with audiences across the UK from the base in the north of England which opens next year. Teams from BBC Sport, Children’s, Learning, Radio 5 Live, FM&T and all staff in BBC Manchester are already due to relocate. The BBC will use the move of Breakfast to build on the show’s current success and enhance its strong reputation for providing news and features from across the UK. The show will also benefit from an iconic new waterside location which offers views of The Lowry Theatre, the Imperial War Museum North, the Peak District and the Manchester Ship Canal. More than three hours per day of live BBC One output will now come from Salford, demonstrating the BBC’s commitment to audiences across the UK. The move will allow BBC Breakfast, 5 Live, current affairs and regional news services to work even more closely together, maximise their impact and bring a fresh approach to production. A stronger presence will boost opportunities for career development and increase the attractiveness of Salford as a career option – not just for BBC staff but those in all fields of journalism.